Mondelez have done a few questionable things in recent years, but perhaps the most questionable yet is their move away from organic chocolate within the Green & Blacks range. 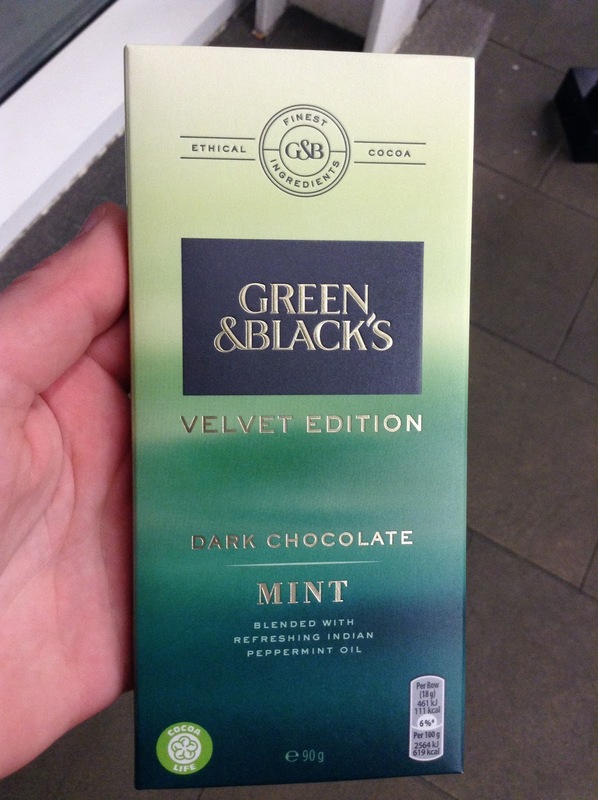 It remains to be seen if all G&B bars will no longer be organic, but so far they've been giving this new non organic Velvet Edition range quite a push in supermarkets. After the disappointing Almond & Blood Orange bar I wasn't going to bother trying any more of the range, however curiosity got the better of me with this Mint version. I do love a minty chocolate, and was curious how this might compare to the regular mint chocolate bar from G&B. The range is reduced to £1.50 at the moment in Tesco, which is still too much for inferior chocolate if you ask me. 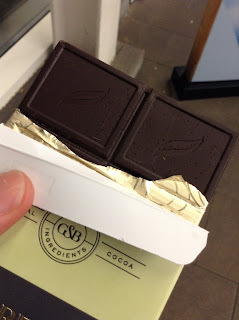 The bars contain 90g which I believe is less than a regular Green & Blacks bar. So not only are they non organic they're giving you less too. Way to go Mondelez! Do forgive my grainy photo, I took it as I was exiting Tesco on a dark night haha! The chocolate did look a bit odd on closer inspection, with a slightly grainy appearance despite there being no crunchy mint pieces added. It tasted of pretty much nothing...there is very little flavour to the dark chocolate (according to Mondelez, consumers don't want dark chocolate to taste of dark chocolate! ), and the mint is no different to that from any other bar. In fact it's quite tame and not punchy enough. Overall the bar tastes less appetizing than the Tesco Mint dark chocolate bars that cost £1 (which aren't actually half bad!) As for the regular Green and Blacks mint bar, it's far superior to this of course - with a richer cocoa flavour and fresher mint taste. Hopefully it hasn't been discontinued to make way for this nonsense! Overall, this bar just reaffirms my feeling that this G&B Velvet Edition range is utterly pointless. The chocolate is flavourless and bland, you get less for your money and still pay a lot. Maybe I should have tried the Raspberry and Hazelnut or Salted Caramel versions, but alas I'm done with them now! Argh, I love the taste of dark chocolate - the idea of buying a bar and it purposely not tasting of dark choc is baffling to me. Fair enough for some of the super dark 90% bars, they're intense but you know what you're getting and can avoid if you want something milder. Not sneaky plain tasting dark choccy! People want dark chocolate that doesn't taste like dark chocolate... Wow. Ok. Well then. No. I agree entirely with Glenn - You're so buying the marketing not the cocoa or the chocolate production. As we suspected, once again they're Mondelezing the hell out of a good product.